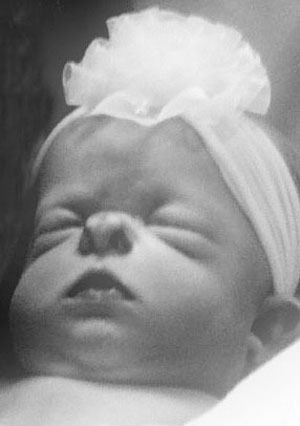 Maesyn Brinlee Pack, beloved daughter of Miles and Brittany Barton Pack, was born and died on Feb. 17. Maesyn passed away in the arms of her father after being allowed to spend a precious hour with her family. Maesyn was born on two of her great-grandma’s birthdays, Mignon Palmer Christley and Erma Unger Price, both of whom are deceased. Maesyn’s birth was greatly anticipated by her family, even though because of her previously diagnosed birth defects, it was unknown if she could survive her birth. What a blessing that she was able to have her birth shared with her brother, sister and grandparents. She gently slipped away to heaven after our brief time together. Maesyn is survived by her parents, brother Miles (age 9) and Maelie (age 1); and her grandparents Mark and Marilyn Pack, all of Salt Lake City; grandparents Butch and Carol Christley Barton of Grantsville; great-grandmother, Patricia Price Barton of Tooele; and great-grandfather, Grant Christley of Greenfield, Mo., and many aunts, uncles and cousins. Graveside services will be held at 11 a.m. on Feb. 25 at the Grantsville City Cemetery, under the direction of Tate Mortuary of Tooele. The family wishes to express thanks to many relatives and friends, and especially to the doctors and nurses at the University of Utah Medical Center. Until we meet again, we love and miss you our sweet angel, Maesyn.